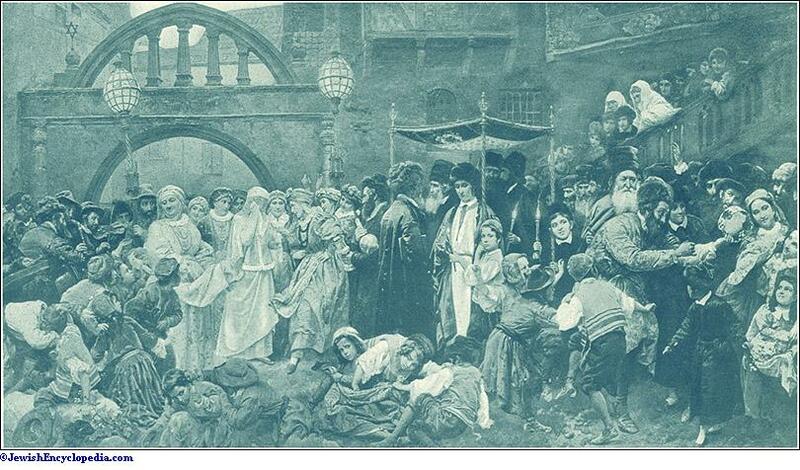 In Poland, even to-day, the bridegroom receives pastry ("chosenbrod") when he visits his betrothed. 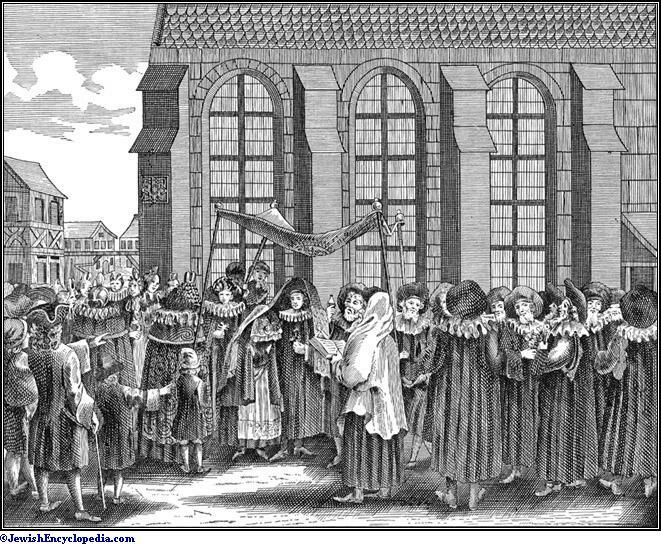 During the week before the wedding-day the betrothed pair was allowed to leave the house only when accompanied. 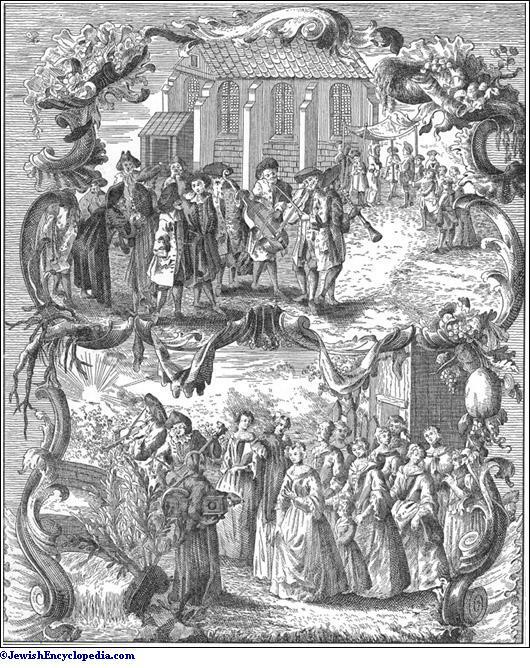 On Friday evening, or sometimes two Sabbaths, before the wedding, a feast was given in honor of the parents; this feast was commonly called "spinnholz" ("sponsalia" or "spindel"), or, in Poland, "vorspiel." 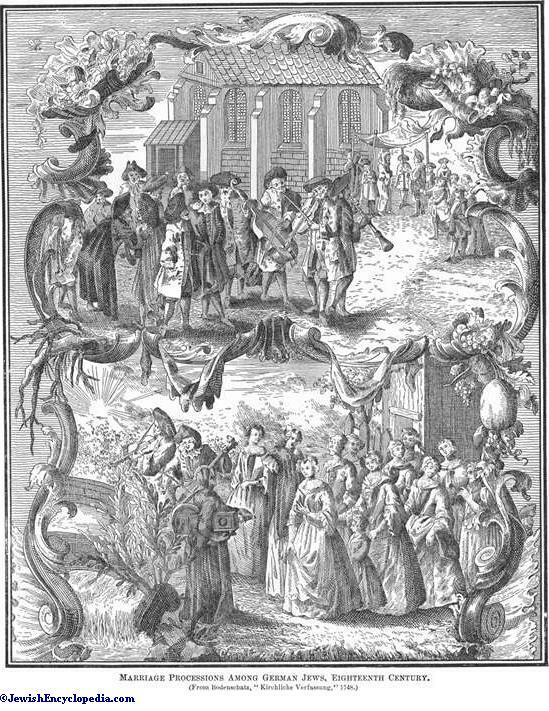 On the day before the wedding the most prominent members of the community carried the presents of the groom to the bride with special ceremonies; as was customary also in non-Jewish circles, the presents consisted generally of a girdle, veil ("covering" before the ceremony still obtains, in conformity with Rebekah's example), mantle ("kursen"), and wreath, subsequently also of a "siflones tefillah," a prayer-book with the inscription ("Love, fraternity, peace, and good-fellowship"). 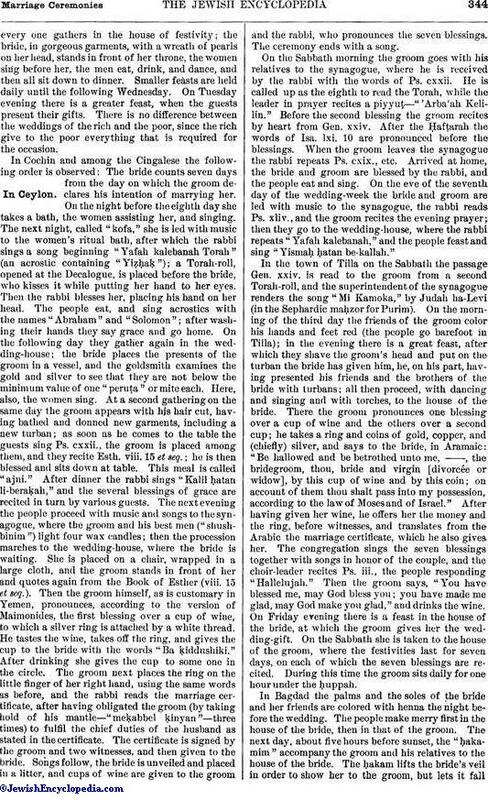 Among the Greco-Turkish Jews a ring was included, called "nissu'in"; among the Greeks and Romans it was called "symbolum" (hence the Jewish "siflones"). 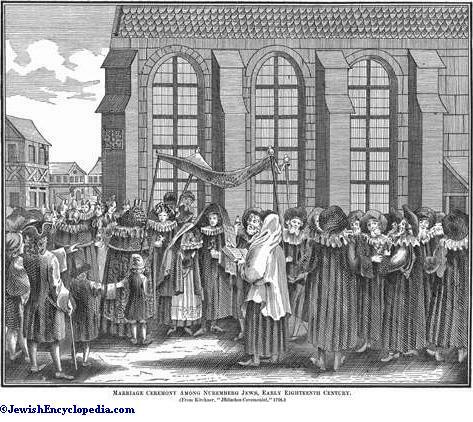 The groom received a ring and shoes, later a ṭallit and a shroud. The rings were handed down in the family; the rings were formerly often of fine workmanship, having the miniature model of a synagogue carved on them and the inscription , later (= "good luck "). 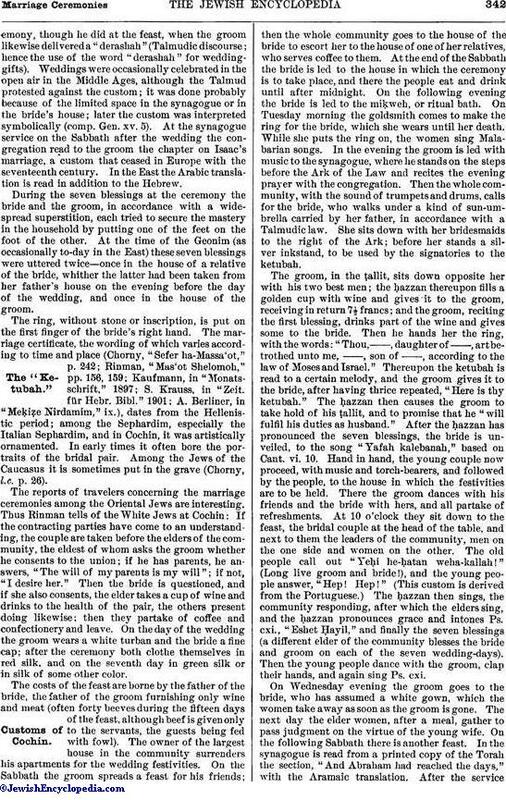 As soon as the groom had sat down beside the Ark of the Law, the morning prayer began, after which the bride was led with music to the door of the synagogue; thence she was escorted by the rabbi and the elders of the community to the bemah (see Almemar), taking her place at the right of the groom (comp. Ps. xlv. 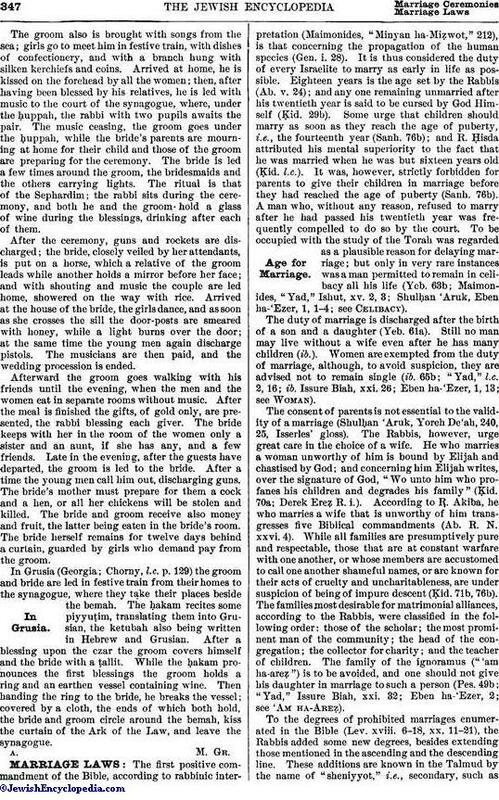 10 [A. V. 9], in which the last letters of the words ["upon thy right hand did stand the queen"], taken in reverse order, spell ["bride"]), where the mothers of the young couple stood. Bride and groom were covered with the ṭallit, or with the long end of the groom's gugel, and wedded. 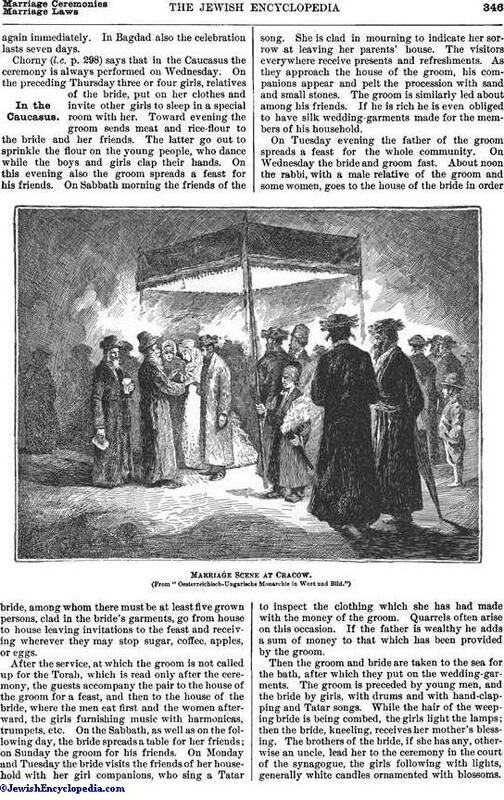 Later the wedding-tent ("ḥuppah") came into use; this was a reminiscence of the litter in which the bride was formerly carried or of the room in which the couple were left alone for a time. Then the groom was escorted home, and after him the bride, whom he met at the door and as she entered he placed her hand on the upper post, thus making her the mistress of the house. 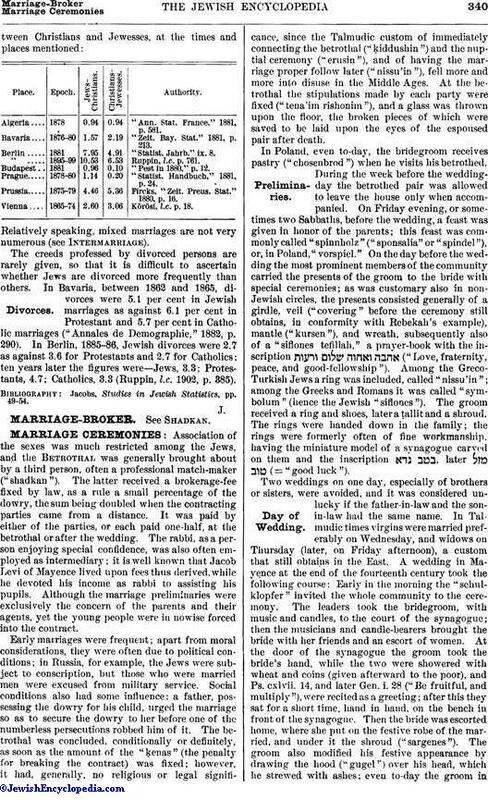 The wedding-festival proper, in the bride's house, did not begin until the evening; it lasted until Sunday morning, but was interrupted by the Sabbath morning service. 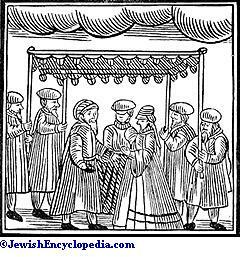 At this, as at every service, the groom was the center of interest; in his honor songs were rendered that grew more numerous as marriages became less frequent, and more solemn as the social and political condition of the Jews was rendered more unfortunate. 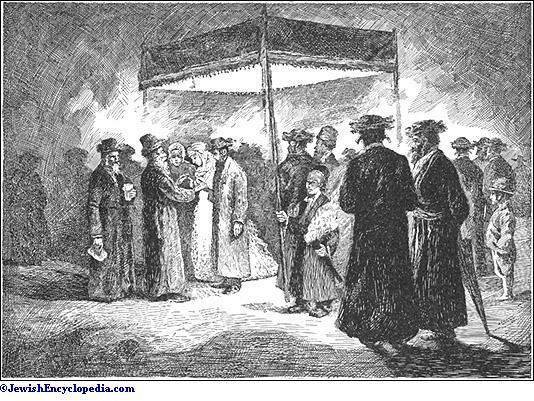 On returning home the groom handed to his young wife his mantle, girdle, and hat to signify that she shared his property.